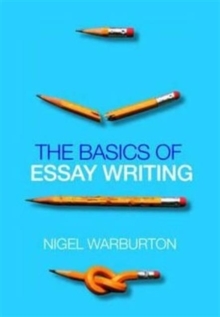 Nigel Warburton, bestselling author and experienced lecturer, provides all the guidance and advice you need to dramatically improve your essay-writing skills. The book opens with a discussion of why it is so important to write a good essay, and proceeds through a step-by-step exploration of exactly what you should consider to improve your essays and marks. You will find help on how to:focus on answering the question askedresearch and plan your essaybuild and sustain an argumentimprove your writing style and tone. The Basics of Essay Writing is packed full of good advice and practical exercises. Students of all ages and in every subject area will find it an easy-to-use and indispensable aid to their studies.